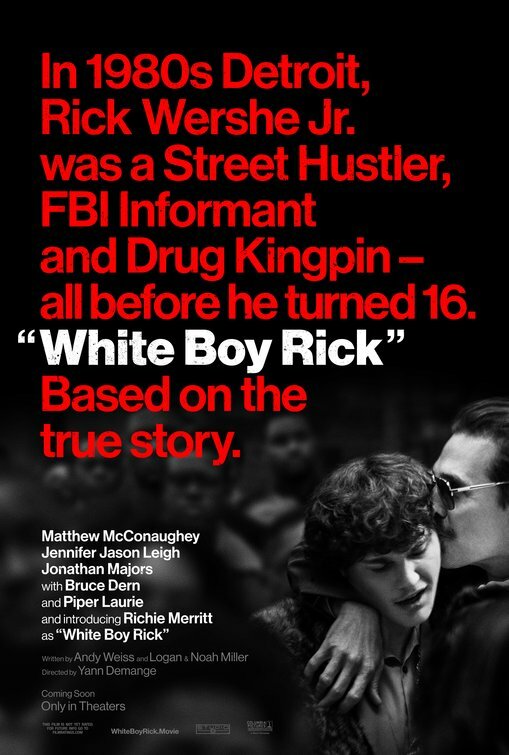 Recipe for disaster: A lower middle class family living in Detroit in the ‘80s near a predominantly African-American section of town; FBI agents who are aware that the father is dealing guns illegally (although they’re not pursuing him) and that the son is developing friendships with the drug dealers in the black community, recruit Rick (Merritt) to become an informant for them. What could go wrong? A lot. The trouble is, there are additional unanticipated factors and events that will complicate the picture. The father, Richard Wershe (McConaughey), is an eternal optimist (“I’m a glass-is-half-full kind of guy”) who hasn’t done well, but sustains his dream of owning a string of video stores that will make him rich and able to take care of his kids, Rick and Dawn (Powley), and no longer need financial help from his parents. He is good at communicating with his son about his business plan of selling guns (which he is clearly overly attached to) to get capital for his dream, but doesn’t seem to have the foggiest notion about guiding Rick or Dawn in sensible behavior and avoiding pitfalls and destructive temptations. So a lot goes down, with Rick getting more and more entrenched in shady dealings, Dawn making poor choices in the company she keeps, and Richard trying desperately to hold everything together. It’s a statement about unmet needs, skimpy education, and desperate plans that have slim chances of success. But the film also takes punches at black-white disparities in the criminal justice system, unethical practices of government agencies, and the inability of government to deal with economically ravaged cities such as Detroit in the 1980’s. This is a difficult, painful film to watch from beginning to end, in its exquisite picture of flawed parenting, inadequacies in government service, seductiveness of drugs in distressed populations and the resultant crime, and the disparities in black vs. white lifestyles and communities and the criminal justice system. The only positive element in all this mess is the example of family loyalty, which would be the primary support sustaining Rick for the rest of his life. 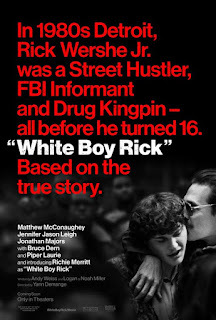 White Boy Rick is a realistic picture of the 1980’s, but, unfortunately, shows that we have not made as much progress in social welfare and justice as we should have (or as I wished we would have). It could have made sharper connections between family dysfunction, social services, and the legal system, and how factors in all areas had such an impact on a young man’s life. The esteemed actor Matthew McConaughey clearly holds this film together in his ability to make the screen come alive when he is present, and then have this presence echo in the scenes where he is absent. For his first film, Richie Merritt makes an impressive appearance, at home with his character and able to show a range of emotion. Although not much more than a cameo, Bruce Dern and his brilliant blue piercing eyes gives us an extra treat. Max Richter’s score with its doomsday tones and dramatic thrusts is a worthy accompaniment. I realize that films like this need to be made, but they are painful to watch because of their realistic commentary about contemporary life.